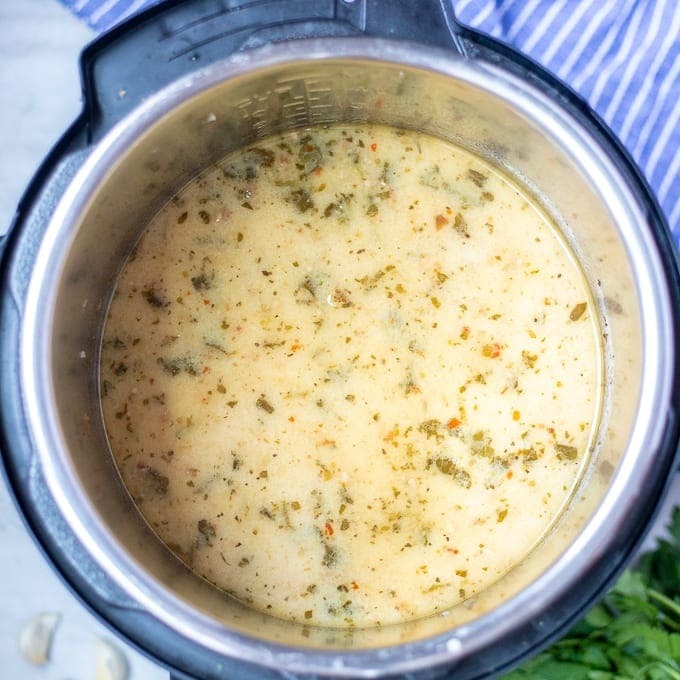 The entire family will love this Instant Pot Zuppa Toscana Soup! This creamy, hearty soup made with bacon, sausage, kale, and potatoes , will be on your table in 30 minutes and tastes better than Olive Garden’s version! If you love soup you may also enjoy Panera Broccoli Cheese Soup, 30 Minute Baked Potato Soup, Slow Cooker Minestrone Soup, or Southwest Turkey Soup. Back in college one of my favorite cheap meals was Olive Garden’s soup and salad special. While I loved those garlic bread sticks, I really loved Olive Garden’s Zuppa Toscana. It is a rich soup made with bacon, sausage, cream and kale. And oh so satisfying! I have to be honest in saying that I have not had the soup and salad special in decades, but I still enjoy making Zuppa Toscana at home. And recently, I recreated one of my favorite soups and adjusted it for the pressure cooker. This Instant Pot Zuppa Toscana is not only EASY to make, it is a family favorite. Which is great, as long as I know not to count on leftovers the next day–my family devours every last drop of this hearty soup! Turn pressure cooker to saute and allow to heat up. While Instant Pot is heating up, chop bacon into small chunks. Saute bacon until browned and crispy. 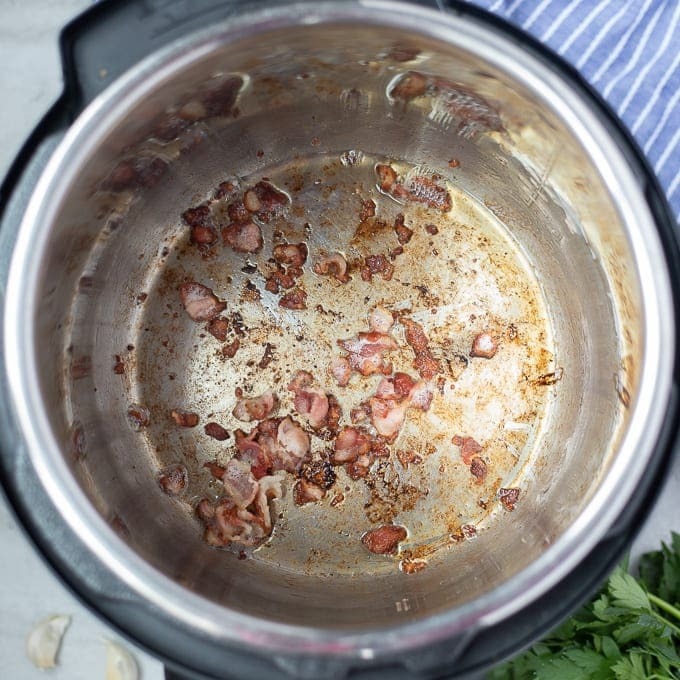 Remove bacon from Instant Pot with slotted spoon and place on paper towel lined plate. Add sausage to bacon grease and break up as it starts to brown. Saute until browned and cooked through, about 4 minutes. Add wine into pressure cooker and allow to cook for 2-3 minutes until alcohol is cooked off. Turn Instant Pot to off. Add in chicken stock, potatoes, salt, pepper, chili flakes, and frozen kale. Let pressure release naturally for 15 minutes. After 15 minutes of natural pressure release, release any remaining pressure by carefully turning the vent knob to the vent position. Stir in cream and place lid back on pressure cooker for 3-5 minutes to let cream heat through. If using FRESH kale, add to pressure cooker at this time. Serve soup, topped with cooked bacon and Parmesan Cheese if desired. I love keeping frozen chopped kale in my freezer at all times. 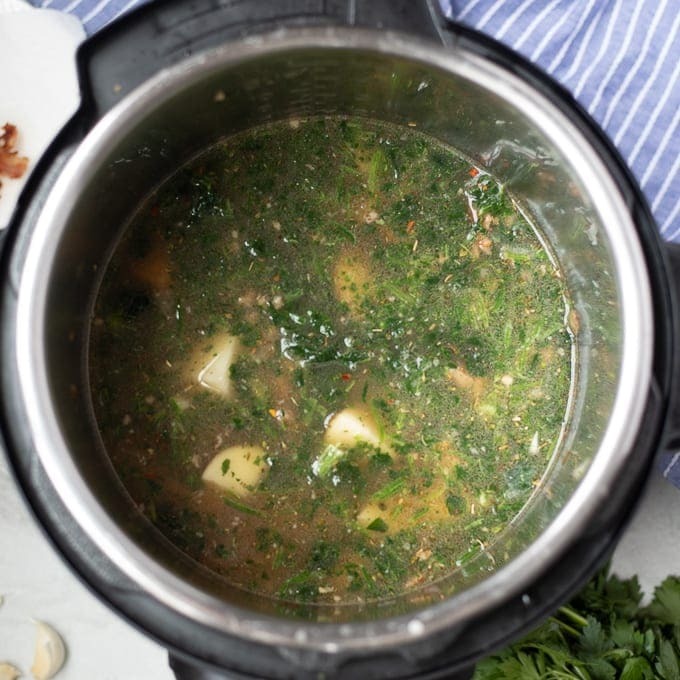 And because it is already washed and chopped, it is the perfect shortcut to making this Instant Pot Zuppa Soup that much easier. Feel free to use fresh kale, just wash well and then chop after removing the thick stem. Add to soup when half and half is added and just leave in pressure cooker long enough to wilt. Feel free to use chicken or turkey Italian Sausage in place of the pork sausage. If you want to omit the bacon, you will need 1 tablespoon olive oil to brown the sausage and onions in. I love the addition of red pepper flakes, but if you are opposed to spicy food, just omit. If you would like to lighten this soup up, feel free to drain off the grease after browning the sausage. You can also use milk in place of the cream. Because of the cream and potatoes, this soup does not freeze well, but lasts in the fridge for 5 days. 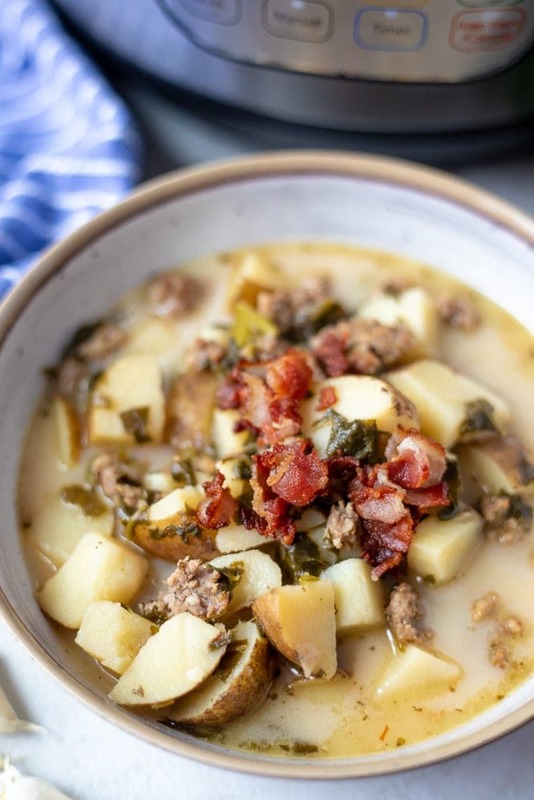 Instant Pot Zuppa Toscana Soup is a creamy, hearty soup made with bacon, sausage, kale, and potatoes in a rich broth. This soup will be on your table in 30 minutes and tastes better than Olive Garden's version! 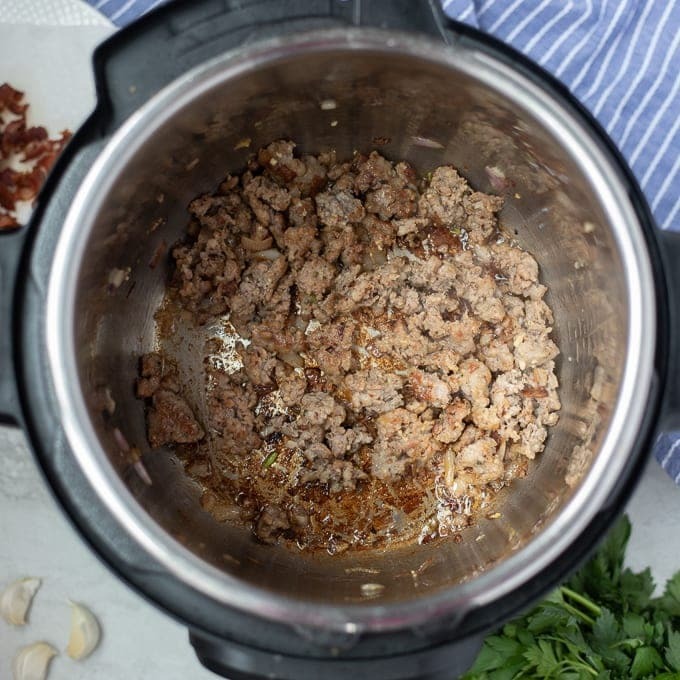 Turn Instant Pot turn saute and allow to heat up. Add in bacon and saute until browned and crispy. Remove bacon using slotted spoon and place on paper towel lined plate. Add in sausage, breaking up as the sausage cooks. After one minute, add in onions and garlic and onions, and saute until browned and cooked through. Add wine into pressure cooker and allow to cook for 2-3 minutes until alcohol is cooked off. Turn Instant Pot to off. Let pressure release naturally for 15 minutes. Release any remaining pressure. If using fresh kale, add when cream is added. This soup looks amazing and easy! Thanks for sharing! You bet Karly–it is really one of our favorites. I left out the chili flakes. This was well enjoyed by all three of us here, but dinner was late. I’m switching from Slow Cooker to Instant Pot, and I get carried away with the idea that it is “Instant”. This took about two hours, start to finish. The listed prep time of five minutes is less than it took for me to wash and chop the potatoes. Oh, my son stole my frozen kale for a smoothie, so I had to run down to the store and get another bag, but my laptop screen hadn’t even timed out by the time I got back. I bumped up the garlic and the bacon amounts. Can’t have too much bacon on hand, since it is a user-adjustable topping.